Thermal Energy Storage Market size will surpass USD 55 Billion by 2024, as reported in the latest study by Global Market Insights, Inc. Molten salt thermal energy storage market, in 2017 was valued over USD 9 billion. Surging demand for large scale storage capacity across the industrial and commercial establishments along with rising deployment of CSP plants will increase the product penetration. Further, limited heat loss coupled with the ability to provide superheated steam are some of the underlying features stimulating the product adoption across various applications. Recent advancements in storage materials and manufacturing will improve the economics of storage and thus will positively influence the thermal energy storage market. Further, increasing need for technologies to accommodate supply and demand mismatch on account of improving the profitability of infrastructure investments will increase the product adoption. The U.S. thermal energy storage market, in 2017 was valued over USD 6 billion. Increasing funding toward research, design and development programs coupled with high fuels costs will stimulate the industry size. In 2017, nearly 41.8 megawatts of energy storage were installed across the region accounting for 46% of year-over-year growth. Further, utilities across 14 states have deployed around 2 gigawatts of energy storage into Integrated Resource Planning (IRP). Increasing focus toward grid modernization on account of growing energy demand, renewable integration and technological advancements will drive the thermal energy storage market size. Rising demand for Heating, Ventilation and Air Conditioning (HVAC) systems complemented by ongoing investments toward the infrastructure development will accelerate the business growth. Increasing applicability across district heating and cooling systems along with rising demand for solar thermal systems will augment the sensible heat thermal energy storage market size. This storage technology will be driven by molten salt-based systems being installed in Concentrated Solar Power (CSP). Relatively simpler designs and rapidly decreasing levelized cost of electricity will accelerate the business growth. 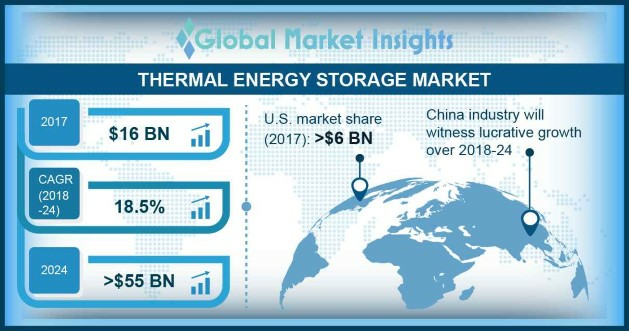 China thermal energy storage market will witness growth on account of high electricity prices along with rapid development of renewable energy sources. Increasing energy demand owing to high economic growth coupled with increasing investments toward energy storage will fuel the product penetration. In the first half of 2018, Jiangsu, Henan, Qinghai and Guangdong provinces announced the construction of energy storage projects with varying capacities totaling 340.5 megawatt. Eminent industry players across the thermal energy storage market include Abengoa Solar, Ice Energy, Tessol, Baltimor Aircoil Company, SolarReserve, TAS Energy, DN Tanks, Steffes Corporation, Goss Engineering, Burns & McDonnell, Caldwell Energy Company, Fafco, BrightSource Energy, Evapco and Cryogel amongst others.